FILE - Secretary of State Rex Tillerson speaks at a press briefing during the United Nations General Assembly, Sept. 20, 2017, in New York. U.S. President Donald Trump appeared to undercut his top diplomat Sunday, saying Secretary of State Rex Tillerson is "wasting his time" trying to negotiate with North Korea's leader. In a series of tweets the president said: "Save your energy Rex, we'll do what has to be done!" North Korea has made it clear it considers the “rocket man” moniker for Kim Jong Un, who succeeded his father at the time of Kim Jong Il’s death in 2011, to be highly insulting. 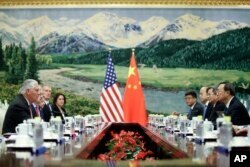 Tillerson, in Beijing the previous day, acknowledged the United States has direct diplomatic channels through which to negotiate with Pyongyang about North Korea’s continued nuclear and ballistic missile tests. The secretary of state, however, gave no details about any recent communication with North Korean diplomats. U.S. Secretary of State Rex Tillerson, left, is seen meeting with China's State Councilor Yang Jiechi at the Great Hall of the People, Saturday, Sept. 30, 2017, in Beijing, China. Trump’s Sunday tweets from his New Jersey golf club caused consternation among some veteran American diplomats. "It's a terrible way to conduct diplomacy," a former acting assistant secretary of state for East Asia, Evans Revere, told VOA. "It raises questions certainly on their part about U.S. seriousness but we're also seeing reactions from the international community that it's raised questions among U.S. partners around the world." If this is not a pre-scripted good cop/bad cop gambit and "if the president really pulled the rug out from under him, that really undercuts his credibility internationally, and he needs to think very clearly about whether he's prepared to continue working under those circumstances," according to Revere, senior director with the Albright Stonebridge Group. It is not the first time Trump has contradicted members of his cabinet, including Tillerson. 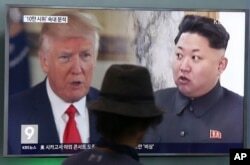 ​Moreover, according to scholars of diplomacy, other U.S. presidents have done so specifically on North Korea which also caused confusion. In 2001, Secretary of State Colin Powell said the administration of President George W. Bush would "pick up where President Clinton left off." But the following day, in a joint press conference with the South Korean president, Bush made it clear he planned to take a more skeptical approach to negotiations with Pyongyang. Considered in this context, Trump’s Sunday tweets are “frankly not nearly as damaging,” according to Balbina Hwang, a visiting professor at Georgetown University. “In the past, U.S. negotiations have been less than maximally successful, because we essentially entered them indicating we wanted or needed to reach a diplomatic solution more than the North Koreans,” Hwang, a former State Department senior advisor on North Korea, tells VOA. “If we try this again, the only possibility of any progress or success is if we convince both Pyongyang and Beijing that we are serious this time about bearing the ultimate costs of ‘really bad options’”. Trump is scheduled to visit China, Japan and South Korea, among other Asian destinations, in November for a trip largely seen at maintaining strong diplomatic pressure on North Korea. Kim, after previous threats by Trump, issued a rare personal response, calling the U.S. president “a mentally deranged dotard.” His foreign minister then suggested Pyongyang might detonate a nuclear weapon over the Pacific Ocean.